Swim goggles for kids offer protection. The eyes are one of the most vulnerable areas of the body, which means it only makes sense you would use swim goggles for kids to protect your young ones when they are spending time in the pool, whether training competitively or for fun. Even during swim lessons you should consider swimming goggles for your children. The following are reasons you should be sure to purchase the right kid’s swim goggles. Perhaps the most important reasons to use swim goggles for kids is to protect their eyes from chlorine and other debris that may be present in the water. Even a well-maintained pool can have small debris that wasn’t picked up in the filter or was recently introduced to the pool. Wearing goggles will help prevent red, itchy and sore eyes after spending time in the water. When you take your child for a regular physical with their doctor, it’s important to ask about wearing swimming goggles. There are certain medical conditions that may require eye protection when entering the water. For instance, children who can’t see well without glasses may need to invest in prescription swim goggles to ensure their eyes are protected, as well as to help them see better while in the water. While swimming goggles are incredibly important for children, when teaching young children how to swim, it is essential to spend some time in the water without kid’s swim goggles. Children who are only exposed to the water while wearing goggles may panic if they fall in the water accidentally without their goggles. This can increase the risk of drowning. Training them to spend time in the water, even without their goggles, will help ensure they are protected when it matters most. In general terms, it’s important to make sure your children have the right swimming goggles if they will be spending a lot of time in the water. While it’s often best to teach them to swim without to avoid panic later, purchasing kid’s swim goggles is a necessity if you want to ensure your child’s eyesight is full protected while swimming competitively. If you’re looking for the best selection of swim goggles for kids, contact us. 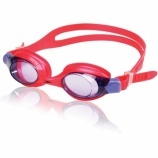 We carry a vast array of swimming goggles designed to fit children well.